Not everyone has perfect credit. Some of us don’t have any credit history at all. That includes college students, those just entering the workforce (or returning following a period of unemployment), and a wealth of other scenarios. Still, despite what some lenders want you to believe, your credit score isn’t a reflection of who you are as a person. Nor is it the last word on the type of loans for which you qualify. Sometimes getting the funds you require is simple as reaching out to loved ones for help. Often, friends and family members will be willing and able to assist in your time of need. They might also have other ideas you hadn’t previously explored. For example, did you know that your car or truck could be an excellent source of income? When you bring in your vehicle in good working condition with a clean title in your name, you could be on your way to securing fast cash. 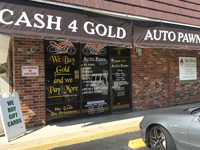 Our friendly and knowledgeable team members are always on hand to answer all your questions about Auto Pawn. Some people choose to get a friend or loved one with good or great credit to sign their name to a loan. One of the main concerns with this option is the fact that your friend or family member will be on the hook if the loan defaults for any reason. That could place you in an awkward and uncomfortable situation with the folks you know best. Thankfully, there are other options. Known as the premier pawn shop in Orange City, Florida, our competitive deals are designed to offer you the most value for your vehicle. We pawn all types of vehicles (cars, trucks, motorcycles, boats) up to $100,000. As you consider all loan options, be careful not make a hasty or unsafe decision. Unfortunately, there are many disreputable lenders out there, as well as folks with nefarious intentions. These people will try to push you to make illegal or immoral transactions. To protect yourself and your property, it’s essential to only work with trustworthy and reputable professionals. 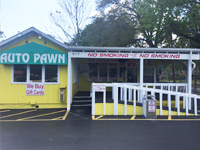 For example, along with vehicle title loans, Auto Pawn also pays the most money for gold and gift cards in Central Florida. We buy all sorts of coins and jewelry, even if it’s broken. Plus, we buy all types of gift cards, including Walmart cards. This makes it easy to turn unused or unwanted items into instant cash. That’s just one of the reasons why we’re known as one of the best Daytona Beach pawn shops. Trying to get a loan can be frustrating, stressful, and overwhelming. Many people even find the process depressing and demoralizing. It doesn’t have to be that way. Instead, there are options to secure the funds you need without being subject to invasive and humiliating inquires. For example, when you bring in your vehicle in good working order with a clean title in your name, you can be on your way toward reaching your financial goals in no time. Best of all, we offer some of the most competitive rates and terms in the area. 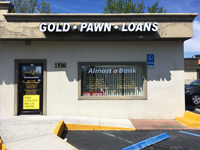 Consistently ranked by customers as a premier pawn shop in New Smyrna Beach, we have 11 Central Florida locations. That makes visiting Auto Pawn simple and convenient. Contact us today with all your questions. Then, drop by one of our locations to get started on your vehicle title loan.